The Beavertail Grip Sleeve is installed by slipping it over the P320’s polymer frame until it seats perfectly into position. The sleeve is precision manufactured to provide a secure and comfortable fit. Once installed, the HandALL sleeve’s finger grooves offer instinctive handling and control of the firearm. The grooves lead into a gentle palm swell that has been carefully designed to fit naturally in the hand. The beavertail built into the grip sleeve rises high along the backstrap of the frame. This provides hand comfort higher on the grip. In addition, the beavertail also cushions the hand during recoil by providing better distribution of recoil forces. The built-in features of the grip sleeve provide comfort and confidence which in turn promote accuracy. The HandALL is built from a long-lasting durable thermoplastic elastomer compound. This rubber ages very gracefully and keeps a firm, tacky feel throughout the life of the grip. It will not harden, split or crack with age or usage. The surface is covered with Hogue’s familiar Cobblestone™ texture, a series of small circular bumps that provide an efficient non-slip, non-irritating grip on the rubber. This model of HandALL Beavertail Grip Sleeve has an MSRP of $10.95 for black, and $12.95 for OD green, flat dark earth, aqua, pink and purple. Hogue Grip Sleeves are manufactured in their family-owned and operated facilities under the direct supervision of the Hogue family. Hogue, Inc. supports local dealers and encourages customers to purchase Hogue products locally. For more information please call Hogue directly at 1-800-438-4747 or visit www.hogueinc.com to find a Hogue dealer near you. 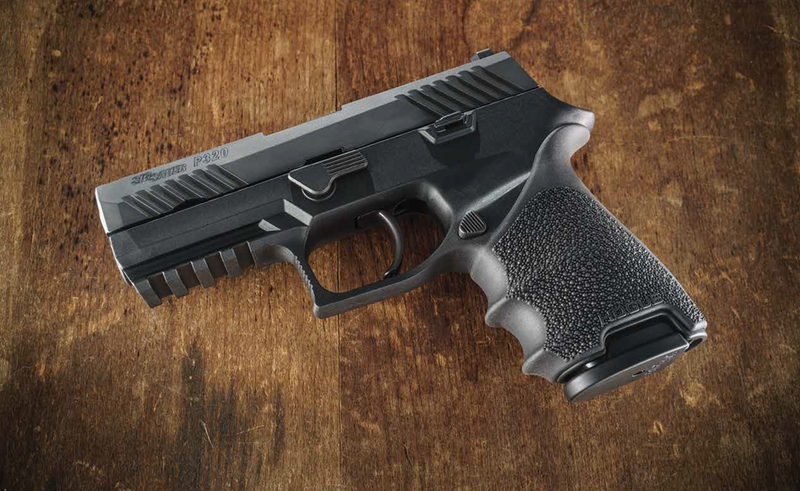 This entry was posted in Accessories, pistols and tagged HandAll, Hogue Inc. SIG, P320, SIG SAUER. Bookmark the permalink.